On 18 March 2018, a 17-year-old youth from Al Mughayyir is arrested by Israeli soldiers at 1:30 a.m. He reports being informed of his right to silence and consulting with a lawyer prior to interrogation. I woke up when I heard military jeeps outside our house. It was around 1:30 a.m. I woke my parents up and shortly afterwards we heard banging at our front door. My father answered and about 10 Israeli soldiers entered our home. One of the soldiers was wearing a facemask. The soldiers separated the males in the family and asked to see our identity cards. They had photographs with them and when they identified me they asked my father to sign a document written in both Hebrew and Arabic saying they had come to arrest me and that my father was present at the time of arrest. My father signed but he was not given a copy. Then the soldiers searched my wardrobe and found a slingshot. They told me to change and say good bye to my family before taking me outside where they blindfolded me and tied my hands to the front with metal handcuffs which were tight and painful. I was then taken to the back of a jeep and made me sit on the metal floor. Inside the jeep a soldier slapped me and swore at me calling my parents “whores”. The jeep drove to a nearby military base where I was put in a shipping container where I sat on the floor for about 3 hours. During this time I was examined by a doctor who removed the blindfold and then put it back on. I was allowed to use the toilet but I could not sleep; the soldiers were very noisy. 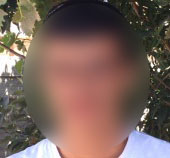 Later I was taken to the police station in Binyamin settlement where I waited in a room until around 3:30 p.m. Then I was taken for interrogation. The interrogator wore a police uniform and had a camera in the room. As soon as I entered the room he removed the blindfold and the handcuffs, gave me a glass of water and allowed me to use the toilet. He gave me a document written in Hebrew and Arabic about my right to remain silent. He asked me to sign it and I did. He also called a lawyer and allowed me to speak to him. The lawyer told me not to confess to anything. Then he called my father and told him I was at Binyamin police station for interrogation. The interrogator then showed me photos of protests during a funeral of a young person from my village who was shot dead by soldiers earlier in the year. They were photos of burning tires and young men with slingshots. He accused me of taking part in the protest but I denied it. Then he thumped the table aggressively and swore by the honour of my mother saying I had to confess. He accused me of lying and told me Muslims don’t lie. This continued for about 2 hours and throughout this time he wanted me to confess. When I told him I had the right to remain silent he told me remaining silent could work against me in court. He told me the judge might sentence me for a long time in prison if I did not confess. He also threatened to arrest my father if I did not confess and called him and told him I was a liar and that lying was not going to take me anywhere. Then he told me it was clear from the images he showed me that I took part in the protest and that I had to confess. I continued to deny the accusation and did not confess. Then he gave me documents in Hebrew and Arabic and asked me to sign them but I refused to sign. I told the interrogator I had no idea what the Hebrew version said and therefore I was not going to sign. He told me the Hebrew was identical to the Arabic but still I refused to sign. Then the interrogator told me he wanted me to think before I am brought back again to see him the following day. Then they took my fingerprints and photograph. At around 7:30 p.m. I was taken to Ofer prison where I was searched in my underwear and then taken to Section 13. On 21 March 2018 I was taken to Ofer military court. My parents were not there because they were not informed and the military judge extended my detention. In all I had about 7 hearings. At the last hearing I was sentenced in a plea bargain to 5 months in prison and fined 3,000 shekels. I was also given a suspended sentence of 1 year in prison valid for 5 years. I spent my prison sentence at Ofer prison where I spent a lot of time playing table tennis. I did not attend classes because I dropped out of school when I was in 11thgrade. I was released on 3 August 2018 and I went home with my father. We arrived home at around 9:00 a.m. My friends took me around the village to celebrate my release and then we went home and had lunch together. My parents did not visit me in prison because they were denied permits for security reasons. This was particularly hard for me when all the other prisoners had visits from family members and I did not.